We're exaggerating a tiny bit here; the '78 928's sticker price was $28,500, or approximately 9.5 times the $2,995 cost of a new '78 Pinto. 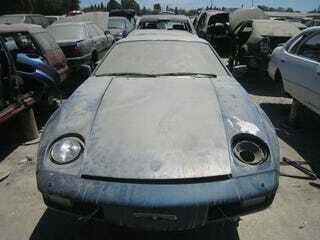 Still, you don't see junked 928s every day! At a typical high-turnover self-service junkyard, you might see a 928 every couple years. This one has been thoroughly ransacked for interior electrical system components, but all the drivetrain and suspension components are still there. Sadly, it doesn't have a 5-speed transmission. Gaze upon this relay/fuse panel and tremble, mere mortals! This is one of the many reasons that 928s get honored by Project Car Hell more often than any other car. From all the leaves and dirt, it appears that this car was someone's long-abandoned Hell Project for a decade or two before finally getting junked. But hey, the last owner was an optimist- check out the condoms, no doubt stockpiled for the glorious day when the car got back on the street. Yes, the ladies can't resist a man in a 928!